A fantastic critical look at Rivette's writings and interviews from the esteemed film critic and writer Jonathan Rosenbaum. Recommended. Jacques Rivette (1 March 1928 - 29 January 2016) was one of the central figures in the French New Wave movement. He began writing articles for Cahiers du Cinema in 1952, and became an increasingly influential figure at the magazine. His career as a director began with short films in the early 50’s and now spans six decades. Rivette’s cinema is complex, experimental and mysterious; it often features multiple plotlines and extensive improvisation. Although often acclaimed by critics, the experimental nature of his films mean they have rarely found a mainstream audience. 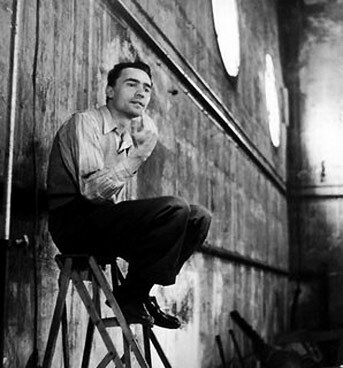 Jacques Rivette was born in Rouen in 1928. In 1950, he began attending the Cine-Club du Quartier Latin in Paris, and contributed articles to its bulletin, the Gazette du Cinema, edited by Eric Rohmer. During this time he embarked on his career as a filmmaker with his first short films, Aux Quatre Coins (1950), Le Quadrille (1950), and Le Divertissement (1952). Rivette’s friendship with Rohmer led him to begin writing articles for the new film journal Cahiers du Cinema. Here he met and became friends with Claude Chabrol, Francois Truffaut, and Jean-Luc Godard. At Cahiers he became one of the first to champion contemporary American cinema as opposed to the staid French “cinema of quality”, then prevalent. He became known as a fierce advocate of the auteur theory and praising the work of such directors as Howard Hawks, Nicholas Ray, John Ford, and Robert Aldritch. In the mid-1950’s he continued his filmmaking education by serving as an assistant to Jean Renoir and Jacques Becker. He also collaborated on the early shorts of Truffaut and Rohmer. His own ambitious short Le Coup du berger (Scholar’s Mate, 1956), inspired his friends and gave the fledgling director the confidence to begin making his first feature. Rivette started shooting Paris nous appartient (Paris Belongs to Us) in the summer of 1958, initially borrowing eighty thousand francs from Cahiers to begin production. In the end it took him two years to complete the film, and that was only after Chabrol and Truffaut, now successful directors in their own right, helped him out with supplies and money. Much of the reason for the delays were due to the young director’s slow and obsessive editing process which entailed reworking sequences over and over until he was satisfied. However, Despite this attention to detail, when it was eventually released, the film played a very limited run. Throughout this period Rivette continued writing for Cahiers du Cinema. From 1963 until 1965, he was editor in chief at the magazine, having replaced Eric Rohmer. During his tenure he guided Cahiers towards a closer engagement with the political implications of the films under review, as well as embracing the modernism of new European directors such as Antonioni. Over the next few years, Rivette made four films that established him as a director with a vision as original and audacious as any of his Nouvelle Vague contemporaries. L’Amour Fou (1968) was a 4 hour film about the production of a play and the dissolution of a marriage. This was followed by the legendary Out One (1971), close to thirteen hours in length, and shown in its entirety only once. The film’s narrative follows 13 disparate individuals who may or may not be part of a secret society. Two outsiders played by Jean-Pierre Leaud and Juliet Berto try to find out the truth behind the conspiracy but ultimately fail. Eventually, Rivette replaced his epic with a later shorter version, Out One: Spectre (1972). The director’s next film, Celine et Julie vont en bateau (Celine and Julie Go Boating, 1974) has become his most famous and best loved work. The film, largely improvised by its two lead actresses, Juliet Berto and Dominique Labourier, concerns two young friends and a mysterious house where a tragic narrative plays out every day like a recurring dream. With its themes of theatricality, paranoia and romance, combined with a compelling examination of the nature of filmmaking, and film-watching, Celine and Julie exemplifies Rivette’s cinematic and thematic landscape. In 1976, Rivette received an offer to make a series of four films, “Les Filles du Feu”. The first of these Duelle (1976), received such negative criticism, that the second Noroit (1976) was withheld from release. The final two installments were never filmed. Merry-Go-Round (1981), Le Pont du Nord (1982), and L’Amour par terre (1984), continued the director’s exploration of the delicate line between imagination and reality, but failed to reach the heights of his earlier work. Rivette’s return to form as a filmmaker began with the release of La Bande des quatre in 1988. The film tells the story of four drama students who meet the same mysterious stranger, who tells them each a different story about a friend in danger. This intriguing premise formed the basis of Rivette’s most compelling film in years. An offhand comment in La Bande des quartres about the painter Frenhofer, a character in a Balzac short story, and his masterpiece La Belle Noiseuse, inspired Rivette to make a film of the same name in 1991. La Belle Noiseuse (The Beautiful Troublemaker), starring Michel Piccoli and Emmanuelle Beart, as the painter and his model, received a strong critical reception and a successful American release. His next work was the two part Jeanne la Pucelle (1994), a re-telling of the life of Joan of Arc. Unlike earlier biopics of the legendary French heroine, and surprisingly for Rivette, this one concentrated less on the metaphysical aspects of the story and more on the political intrigues going on at the time. Va Savoir (Who Knows, 2001), a romantic comedy drama, which once again returned the milieu of the theatre and the play within a play construction. With its charm, wit, and shorter running time, the film found a receptive audience both in France and abroad. Histoire de Marie and Julien (2003) by contrast had a darker more abstract tone with a fantastical element reminiscent of Jean Cocteau. Ne touchez pas la hache (Don’t Touch the Axe, 2007), was another costume picture, this time starring Guillaume Depardieu in a tale of romantic obsession. A late bloomer who is still less well known than his new wave colleagues, Jacques Rivette has nevertheless built up an impressive body of work. His challenging, innovative films demand a level of attention unusual even by the standards of his contemporaries. While many find his stories obscure and frustrating, others have championed him as the most important of all the New Wave directors. Among these are the critic David Thomson, who has described him as “the most important filmmaker of the last thirty-five years”. Need suggestions? See our list of the Top 10 Films of Jacques Rivette. Jean Renoir Jean Renoir 1967 documentary three episodes from the TV series Cinéastes de notre temps: La recherché du relatif, La direction d'acteurs and La regle et l'exception. La Belle noiseuse 1991 feature Official alternate version: La Belle Noiseuse: Divertimento (1991; 120 minutes). Paris Segment One of Ninon's Adventures 1995 documentary Part of the omnibus film Lumiere and Company. Va savoir Who Knows 2001 feature Official alternate cut: Va savoir+ (2002; 220 minutes).